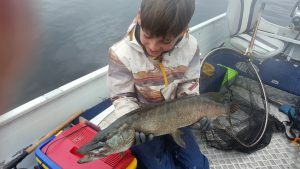 Predator Fishing Ireland – Mark’s PB Day!! Predator Fishing guide John and myself had the pleasure of guiding Gilles, Roche and there sons Mark and Max from France for two days. Weather wasn’t to bad over the two with just a little rain. First days fishing we landed a total of 11 pike between the two boats. 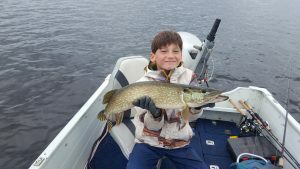 There was no big fish but the boys had fun. Day two we changed venue and it was a better day. 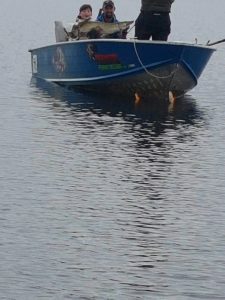 14 pike were landed between the two boats, which included some big fish. Young Mark was the man of the day, landing the top four fish. 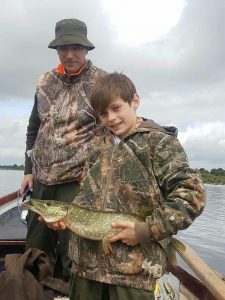 Mark got his personal best to-day when he caught an 80cm pike. He then went on to beat his PB three more times catching an 86cm, 100cm and the best of the day 102cm. It was a great two days with both families.